Karim Aga Kahn was a regular client of Maserati ordering both regular Maseratis and also a bunch of special versions. In 1971 he ordered a new Maserati 4-door sport saloon custom build by Carrozzeria Frua. The car was built on the platform of the Maserati Indy and featured in the 002 car the 4,7 Liter engine and in the 004 Aga Kahn car the massive 4,9 Liter engine. The first car was introduced on the 1971 Paris Motor Show and again in 1972 Geneva Motor Show. As said one car was created for and delivered to the Aga Khan in 1974 and the other Frua II was delivered to the Spanish Royal Family. 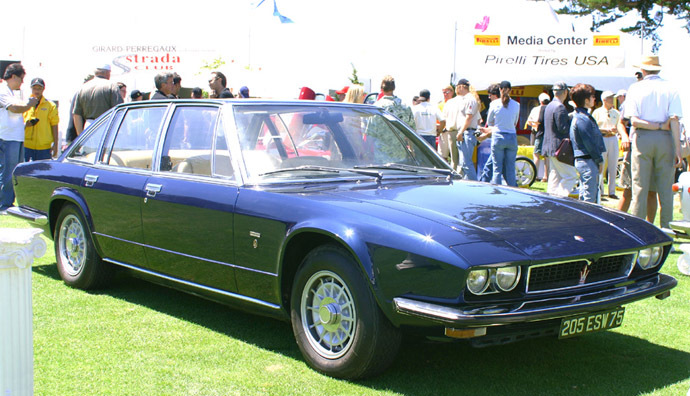 Although the Frua Quattroporte II received an official Maserati chassis code (AM 121) and looked a million Dollars, it never made the production stage. Pietro Frua hoped it would be the successor of his own Quattroporte I, but Citroen took over Maserati in the mid 70′s and had their own ideas of how the Quattroporte II should look.